We have two vines growing in our glasshouses – old classics Muscat of Alexandria, which has delivered great crops of fine dessert grapes for the past two years, and Black Hamburg, which is a year or so younger and has yet to give a decent bunch. Now we have added a row of vines outdoors. The space outside the potting shed has been a bit of a wasteland since the project began. It is the only part of the kitchen garden that has yet to be completed. The plan for the last few years has been to put some beds in for cutting flowers, but we have not gotten around to it thus far. As a start, though, mother-in-law Riitta and I put a new border in alongside the main path to support a row of outdoor vines. The first task was to sink some round posts into the ground to support the training wires. Deep holes were dug with a post digger, using a large crowbar to loosen the soil when stones got in the way. Extra posts were driven in deep at each end, at about 45 degrees, using a sledgehammer. These provide the bracing that keeps the end posts upright. 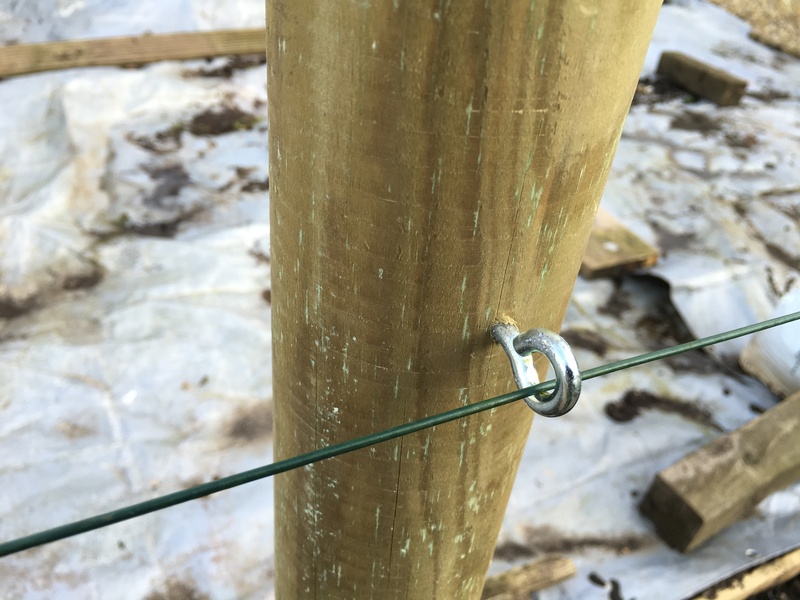 The three vertical posts were dropped into their holes, set in position with the aid of a spirit level, and the soil rammed around them with the sledgehammer to firmly locate them in place. 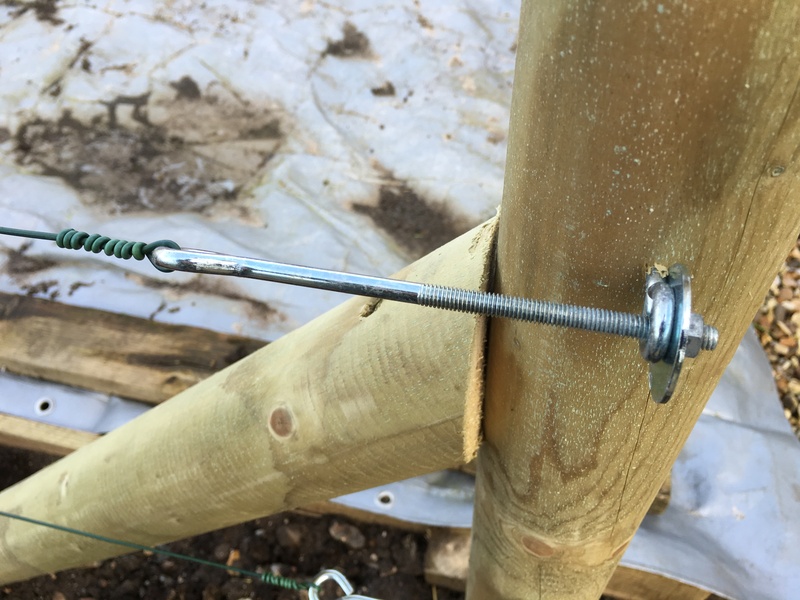 A couple of four inch screws secure the braces to the uprights. Vine eyes and tension bolts were used to secure three runs of heavy duty plastic coated wire that will, in due course, provide support for the vines. Vines can be trained in a variety of ways. In each of our glasshouses a single vine has been trained in a T shape to cover the entire length of 20 feet or so. 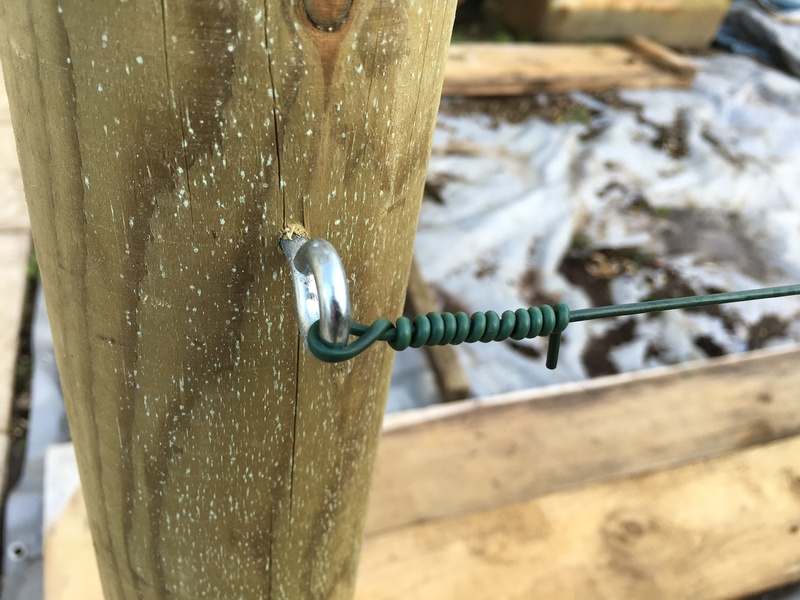 When grown outdoors, especially for wine, planting distances can be quite close. Following a little research we decided to plant at a spacing of around four feet. As we want dessert grapes, we will need to limit the number of bunches per vine, but with these spacings we can fit half a dozen different sorts into the 25 foot length of the border. So far we have added four vines to the border: Zilga, Lakemont, Phoenix, and Muscat Bleu. Zilga is a particularly cold hardy variety from the Baltic bearing dark purple-black grapes. I brought this back from a visit to Finland and it will be interesting to see how it appreciates our comparatively mild climate. Seedless grapes generally need warmer conditions than can be offered here, but there are some varieties one can try. Lakemont is one of the seedless sorts that, although preferring a glasshouse, stands a fair chance of producing some good bunches of white grapes if located in a warm spot outdoors. Phoenix is a fairly modern cross, bred in Germany in the 1960s, where it is used as wine grape. It should ripen well outdoors, producing white grapes that can also serve as table grapes. Muscat Bleu, as the name suggests, is a dark skinned grape with a muscat flavour. Bred in Switzerland in the 1930s, it should perform well outdoors and can be used for both wine and dessert purposes. 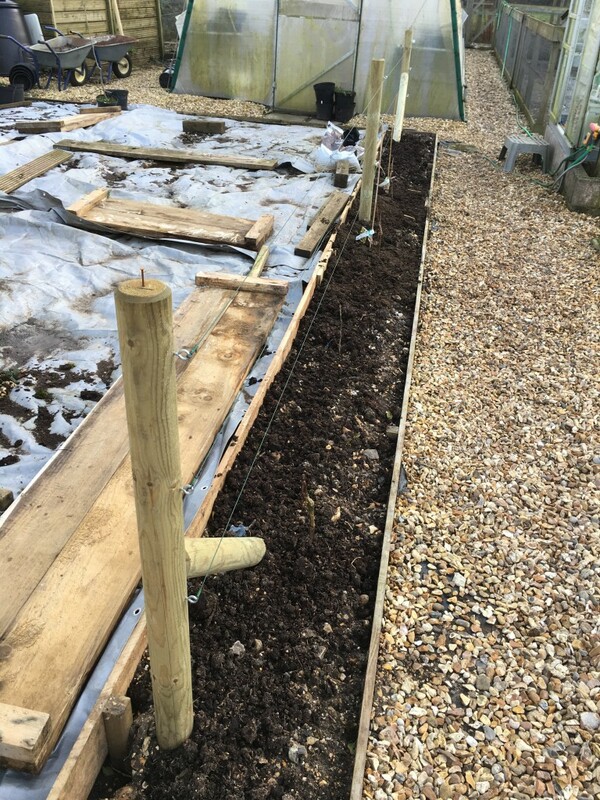 After planting, the border, which has not previously been cultivated, received a good mulch of manure and compost. I have not yet decided how I am going to train the vines. Some will probably adopt a double Goyut, but I would like to use Chablis pruning on at least one. The latter is an approach I have not used before, but discussed in detail with an expert when viewing the vines on a visit to a small Champagne house last year. Vines usually come with a short length of old wood above the graft and one or two long vertical stems of one year old wood above that. 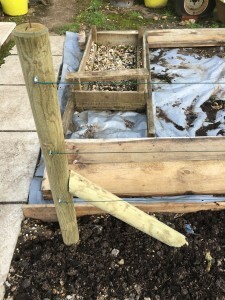 Most of this young wood is not useful, in the first instance, for either method of training, so these vertical stems were pruned back somewhat to about six inches. They may be cut further back once it is completely clear which buds will develop. 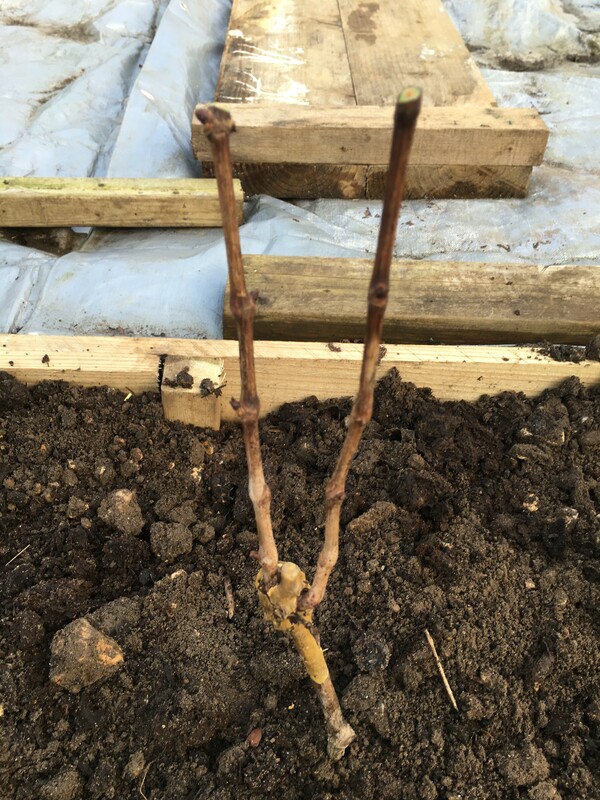 This entry was posted in Garden diary and tagged grapes on February 11, 2016 by JV.